Here's wishing all readers a very Happy New Year 2015. As 2014 petered out I could not help but think that the year saw the continuation of the relentless attack by the elected government on access to justice for the average citizen. The severe cuts to legal aid brought about by the Legal Aid, Sentencing and Punishment of Offenders Act 2012 Part 1 came fully into force from 1st April 2013 but the cuts really began to be felt in 2014 with many courts having to deal with numerous litigants-in-person who, quite understandably, have little or no knowledge of law or the processes of the court. "The State" is, of course, always adequately represented. The government also sought - and continues to seek - restrictions on judicial review which is a last resort but absolutely vital method of ensuring that government and other public bodies operate in a lawful manner. On these topics please see The Justice Gap 1st January - Democracy, Legal Aid and the Election. As for the future, the nation's relationship with the European Convention on Human Rights is also under threat at least from the Conservative Party. Here is my view of the Conservative proposals with links to many other views. I blogged about the Magistrates' Courts - Reforming the Role of Magistrates 18th November. It may be that no reform will take place from the dying embers of the present Parliament / Coalition government. 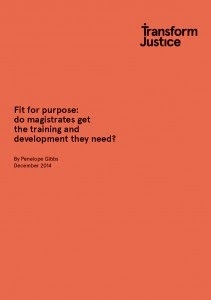 However, Transform Justice has produced - Fit for Purpose: do magistrates get the training and development they need? The simple answer to that must surely be that, since cuts to funding began to bite, they do not. Minimal basic training can hardly be adequate several years down the line! This is somewhat worrying given the plans in the Criminal Justice and Courts Bill Part 3 to permit justices (JPs) to sit alone and to try "on the papers" certain types of "straightforward" case. Recruitment for the magistracy has been severely curtailed in most areas and the number of serving justices has markedly declined over the last 5 years. The future of "lay justice" in England and Wales will inevitably be on the justice agenda of any future government. 2015 is the time when candidates in the forthcoming election should be pressed for answers as to what they would do about all of these matters: access to justice and legal aid; judicial review; human rights etc. In a democratic society these are vital matters. As things stand. the next Parliament will be basically locked in for 5 years by the unsatisfactory Fixed-Term Parliaments Act 2011 so that the election after 2015 will be on the first Thursday in May 2020. If a week is a long time in politics, that is an age. The choice of government is therefore going to be the biggest issue of 2015. Something is rotten in the State .... !